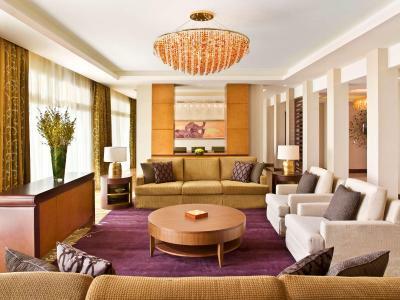 Lock in a great price for Grand Hyatt Doha Hotel & Villas – rated 8.2 by recent guests! We love the ambiance of the place, it is not crowded. Suitable for people like us who just want to relax and enjoy the moment. the staff are very accommodating and friendly. They clean our room regularly without telling them. The room is very cozy and comfy. The food at isaan is very delicious and tasty. Overall it was a great experience. definitely we will come back. They are all friendly and accomodating. From the valet service, reception, room service operator and attendants, Grand Club staff, pool and beach staff. We really had a wonderful experience because of them. Clean, comfortable, relaxing, and elegant. Staff incredible, so willing to please. Amazing facilities including beach, infinity pool, selection of quality restaurants and bars. 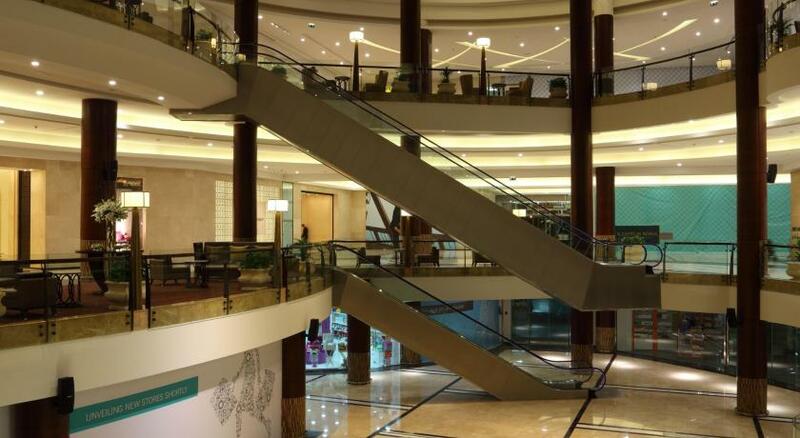 Lagoona mall across the street and accessible to local attractions by taxi. Locations . Facilities . Flexible free checkout time . It was beautiful. The rooms were nice and clean. We did eat at every restaurant in the hotel in the three days that we were there and everything that we had was delicious. The staff was all very helpful and friendly. The hotel has security upon entry like at the airport with metal detectors and a scanner. It gives you a feeling of security or for some it could be a feeling of paranoia. 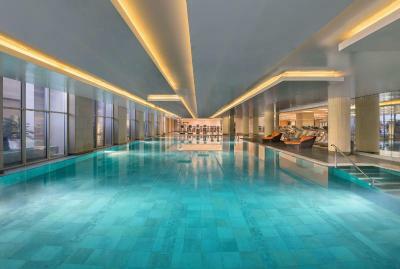 Grand Hyatt Doha Hotel & Villas This rating is a reflection of how the property compares to the industry standard when it comes to price, facilities and services available. It's based on a self-evaluation by the property. Use this rating to help choose your stay! 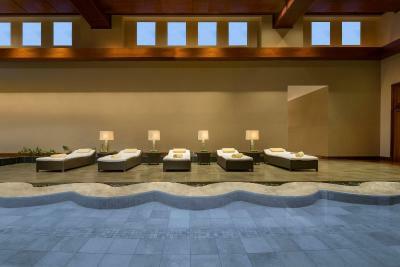 Located shoreline of the new West Bay Lagoon district, Grand Hyatt Doha features panoramic views of the Arabian Gulf. 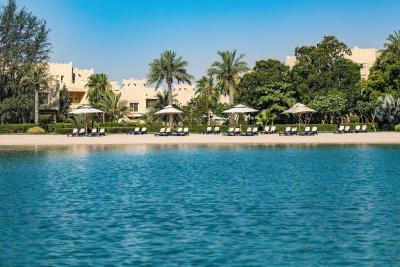 It offers traditional Arabian architecture for it's 249 elegant rooms and suites as well as it's 91 luxurious villas, indoor and outdoor pools and a 1312 foot private beach area. It is a 2-minutes drive from Doha Golf Club. 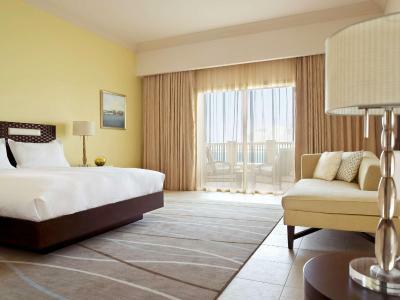 The bright, airy accommodations features a balcony looking the Arabian Gulf or Doha city center. 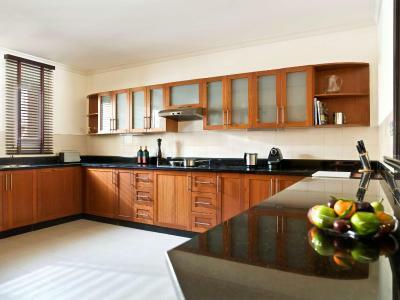 Some units offer a kitchen and a seating area while each unit is fitted with contemporary furnishings. 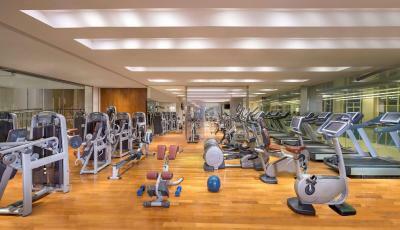 Guests can enjoy a fully equipped fitness center. Jaula Spa, where elegant gardens and indoor tranquility pools built to emulate a small village of happiness and relaxation. The hotel features world class dining outlets including it's signature restaurant, Isaan, which serves authentic Thai cuisine and Santa Monica Breakfast Club which is one of the best American restaurants in Doha. Fine wines are served at the hotel’s main bar, Dunes. The hotel’s business center offers seamless, professional secretarial services providing executive travelers with an office away from the office, with wireless connectivity and high-speed internet access. The Pearl Qatar and Doha Golf Course are a 10 minute drive from the hotel while Hamad International Airport is 25 minutes away by car. Airport limousine and personal airport meet and assist services are available upon guests’ request. 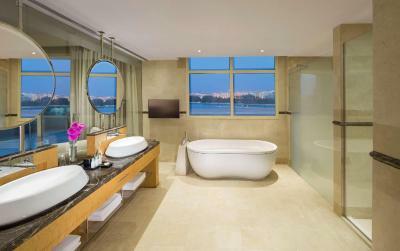 When would you like to stay at Grand Hyatt Doha Hotel & Villas? This air-conditioned room features free WiFi, a flat-screen TV, a work desk and a mini bar. It includes a safety deposit box and ironing facilities. The bathroom is fitted with a bath and shower and offers free toiletries along with slippers. 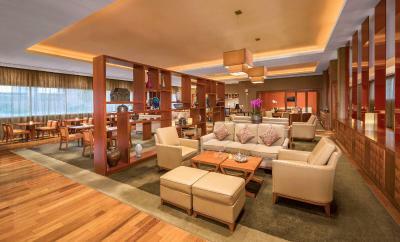 This air-conditioned room features free WiFi and executive lounge access. It includes a flat-screen TV, a work desk, a mini bar, a safety deposit box and ironing facilities. The bathroom is fitted with a bath and shower and offers free toiletries along with slippers. 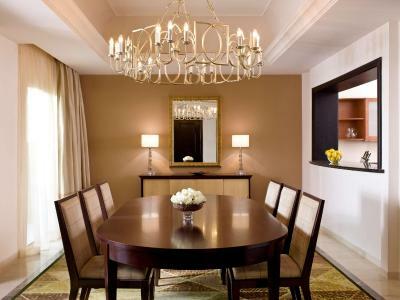 This air-conditioned room features free WiFi and executive lounge access. It includes a flat-screen TV, a dining area, a seating area, a work desk and a mini bar. The bathroom is fitted with a bath and shower and offers free toiletries along with slippers. This air-conditioned villa features free WiFi. It includes a flat-screen TV, a dining area, a seating area, a work desk, a mini bar and a fully equipped kitchen. The bathroom is fitted with a bath and shower and offers free toiletries along with slippers. 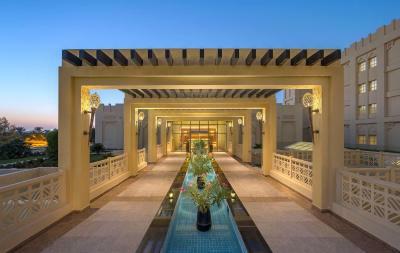 House Rules Grand Hyatt Doha Hotel & Villas takes special requests – add in the next step! Grand Hyatt Doha Hotel &amp; Villas accepts these cards and reserves the right to temporarily hold an amount prior to arrival. Grand Hyatt Doha Hotel & Villas accepts these cards and reserves the right to temporarily hold an amount prior to arrival. Please note that only families and couples are allowed in the villas. Parties and/or loud music are strictly prohibited. As per the law, Qatari couples will be required to present their identification cards and original marriage certificate upon check-in. Qatari ladies below the age of 30 will not be checked-in without their spouse or immediate family member. Villa visitors will be required to register at the reception with a valid Qatari ID. The beach is strange. Water is shallow and dirty. Bottom is made of some kind of clay. Sometimes pieces of concrete. Better to write in advertising that the sea and beach is not natural but man-made small gulf. The grounds of the hotel were well maintained as generally was the hotel. The obvious is that the rooms and suites are now tired and need a significant refreshment. The staff were attentive but did miss the detail at times, having worked in the Middle East for a considerable period of time I understand the challenge. The staff were very friendly and very helpful and the facilities were excellent. The hotel did plenty of pre-Debits (and pre-authorizations with no release so far) from my credit card even if they are not allowed to. The first night was although charges after I have told them that I will pay with another card at the end. Furthermore they were not able to give me a written guarantee that the first night will be refunded when I checked out. The hotel had not the room available we had booked for the first night!!! After we arrived we were sent to a villa (we have an upgrade for you). But this villa was a huge downgrade (no view and not cozy. We had a lot of discussions but finally we got another proper room (what we have booked) after one night. Sometimes we had to call more than one time for new water on the room. One day the room service was not there. To get to the beach you need ~5 min of walk and you have to pass a restaurant. This was not so very comfortable always disturbing people while eating. The cards for the rooms stopped working several times and had to be changed. There will be a 2000 QAR deposit only for the room which is not mentioned at all in booking. The release of pre authorizations needs two weeks. This is tooo long!!!! I cannot recommend this place. In total it is not enough what you get for that price and for a 5 star hotel. The beds in the club double room were really comfortable. The view in our room was although very nice. The hotel has an own little night club which is not disturbing at all.